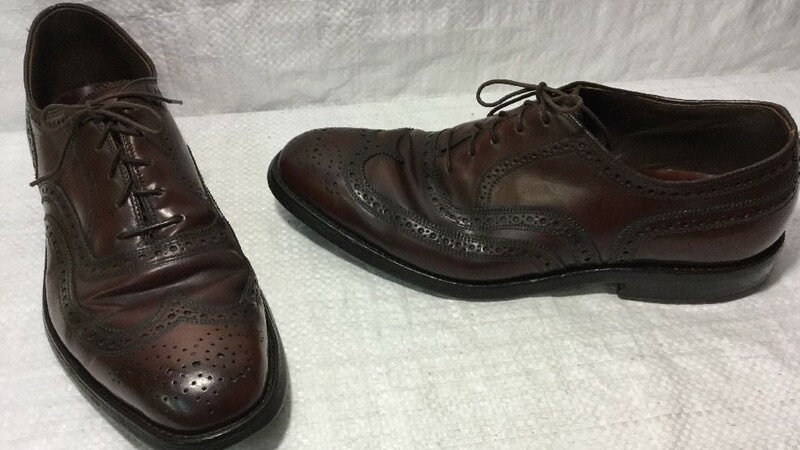 If you are interested in vintage shoes (I know you are), on eBay occasionally you will find amazing, unworn shoes that are decades old. New old stock (NOS), these pairs are called. These listings make you wonder why someone would buy a such a nice pair of shoes but then decide to put them on the shelf for 40 or 50 years and never wear them. And they make you ask yourself why is the seller wanting so much money for them. And you hope that the pair doesn’t sell and that the seller eventually lowers the price to something more reasonable. So you can buy them. But then the shoes sell and you walk around glumly the next day thinking about all the injustice in the world. And forgetting to walk the dog. This never happens to me. Of course. Usually during an eBay shopping experience, I find (and you find), junky shoes in poor condition. But sometimes there are nice shoes in poor condition. Unlike the NOS shoes, these shoes were worn and not treated with care. 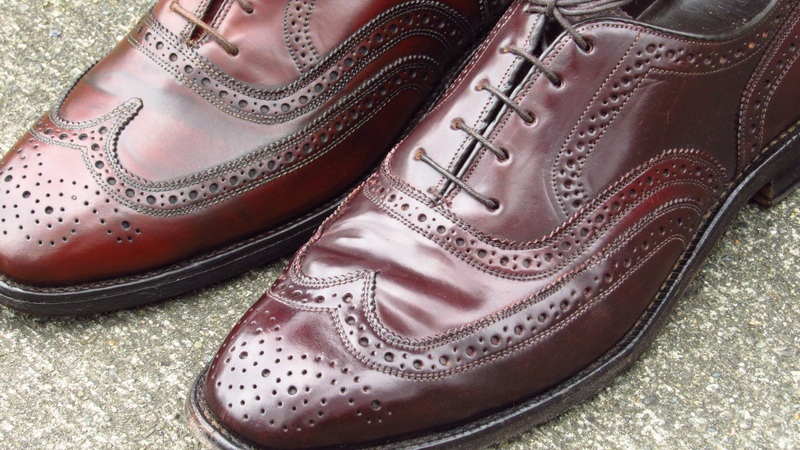 They might have been never polished and never stored with shoe trees. These shoes were abandoned by their owners. Orphaned. “Please, sir, I want some more conditioner”. “WHAT?!”. I sometimes buy these orphaned shoes and bring the shoes back to a happier place. Like Peter Pan. Or maybe Colonel Kurtz since some people may consider my methods “unsound”. 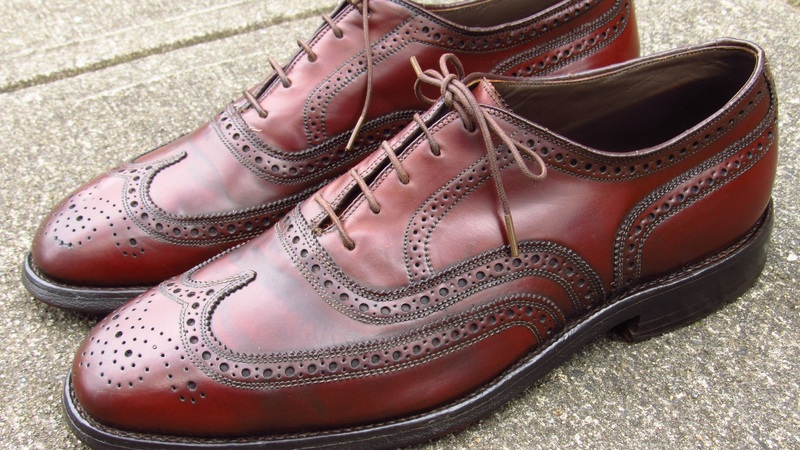 The shoes in this post are a pair of Johnston & Murphy Crown Aristocraft Shell Cordovan wingtips. I found them on eBay listed for $11. 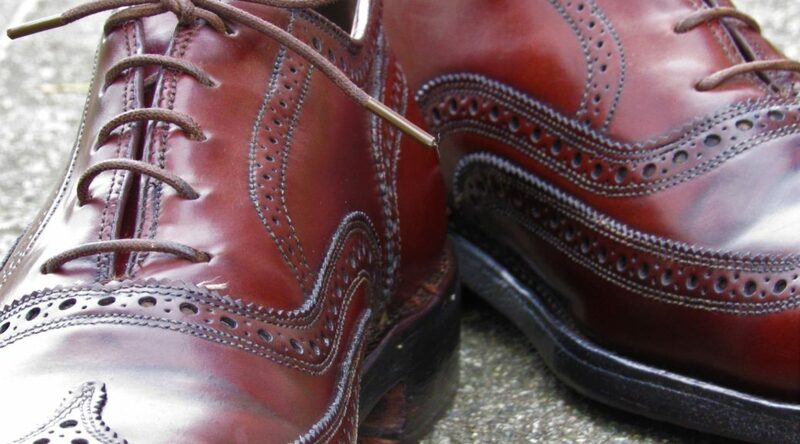 I recognized them as Shell Cordovan due to the lack of creases in the leather. I put them on my Watchlist and I also put in a minimum bid for the shoes. No one else ended up bidding on them. This is how the shoes looked when I received them. Dirty and curled. Since the shoes were cheap and not my size, I thought they would be good candidates for experimentation. 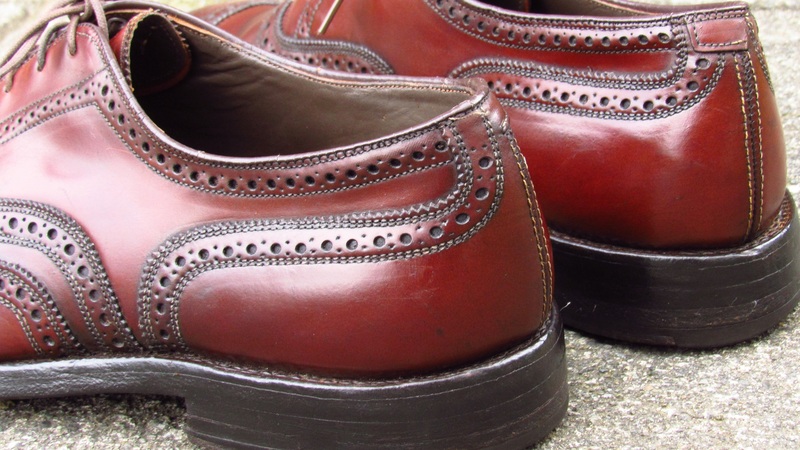 I have previously used a water soaking to reshape calf leather shoes but never Shell Cordovan. I wanted to try the process with this pair. I have had a number of people ask me about doing so. The question had to get answered. Does it work? Cleaned and stripped them with Saphir RenoMat. Don’t scrub hard with RenoMat. Be gentle. Below is a photo the shoes after the first round of cleaning and conditioning. I wanted the shoes to be clean(ish) before the soaking. 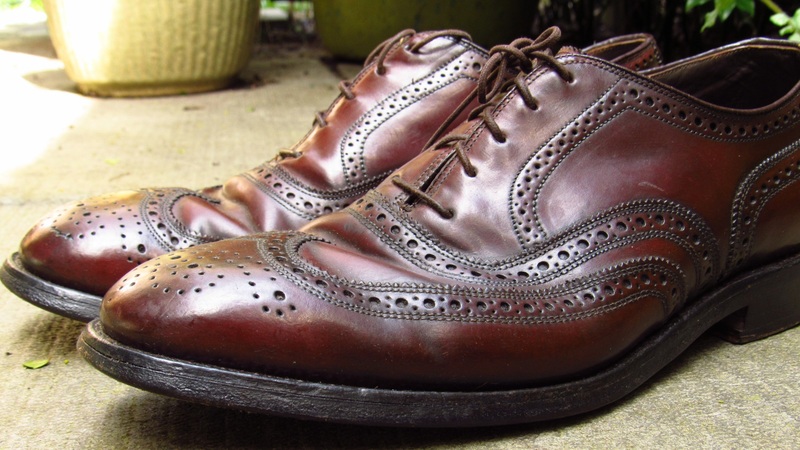 I also believe its important to strip the shoes of old polish so the water penetrates the leather evenly. I used shoe trees while doing the treatments but the shoes were still curled. I gave the pair a couple days to rest after these treatments. 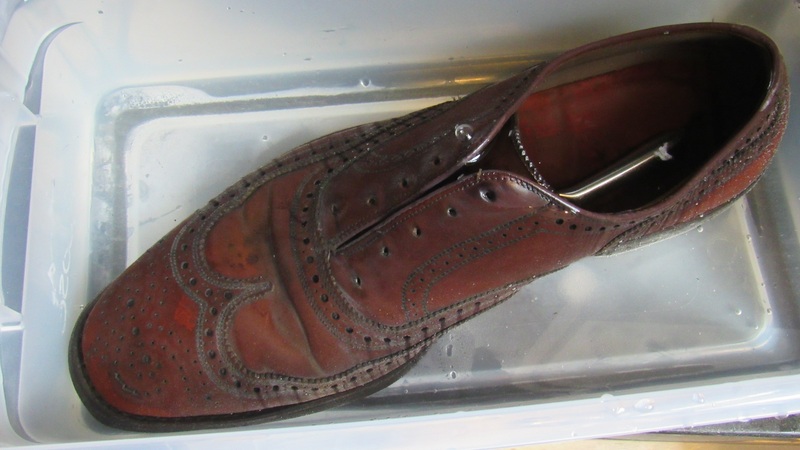 Originally, I planned on soaking the shoes for 30 minutes but I found that Shell does not absorb water as quickly as calfskin. After 30 minutes, there were significant areas that weren’t saturated. The same was true at the one and two hour marks. Finally, after four hours, I couldn’t find a dry area and I pulled the shoes out of the water. I gently dried the shoes and allowed them to dry upside down on a towel for 30 minutes. Then I inserted tight fitting cedar shoe trees and allowed them to dry in front of a floor register for 36 hours. This is the pair when dry. While drying, the leather tightened up significantly and he curl was gone. Success. I gave the pair a few more rounds of conditioning and some neutral Collonil cream. I did not use any colored creams on the pair. I did a light wet sanding of the vamp using a high grit (3200) sandpaper to see if I could remove some of the dark roll bands. It didn’t help much. Would I recommend soaking Shell Cordovan? Maybe. I haven’t seen many Shell shoes with this bad of a curl. So this method is excessive for any Shell uppers that are decent condition. And I have only tried it with a single pair and don’t know how they wear long term. I have no plans to do it again with another pair I own but would use the technique again for another misshapen pair. 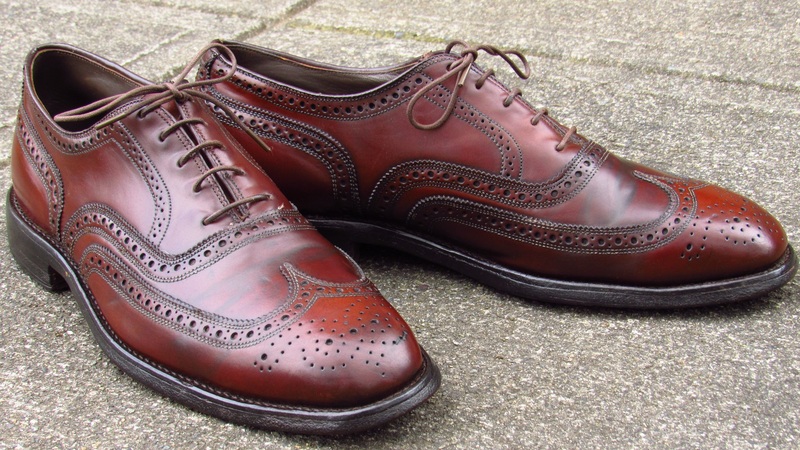 I would recommend buying a pair of Johnston & Murphy Shell Cordovan shoes if you can find a pair. Just imagine rolling into the office with this pair. The ladies would say “Damn”. And the guys would nod with approval as you talk about the virtues of equine leather. I have had this fantasy. It hasn’t happened to me. Yet. But it could for you. Once you move on from your Onitsuka Tigers. 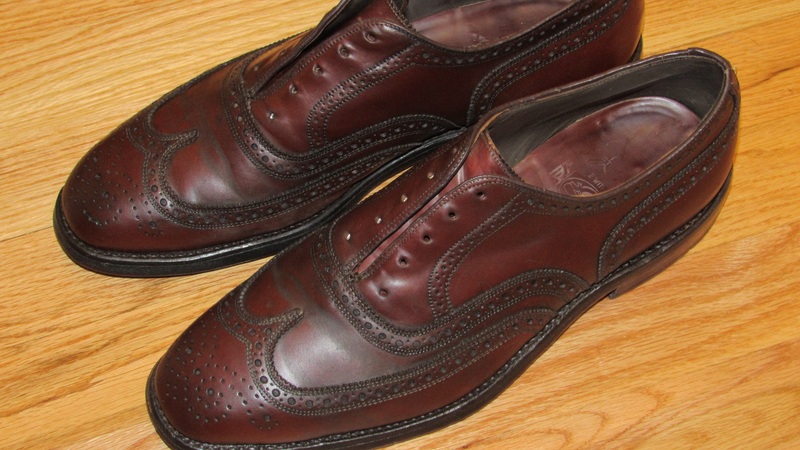 I have another pair of Shell Crown Aristocraft shoes that I wear frequently. They are nice shoes. I have always liked the J&M heel. Its sturdy and wears like iron. It gives much better traction than my Florsheim v-cleat heels. This pair is almost auburn in color and the Shell upper is less shiny than other Shell pairs I own. The Shell almost looks a bit raw in appearance. I am not sure if this is due to the lack of treatment at the factory or the poor maintenance of the shoes. 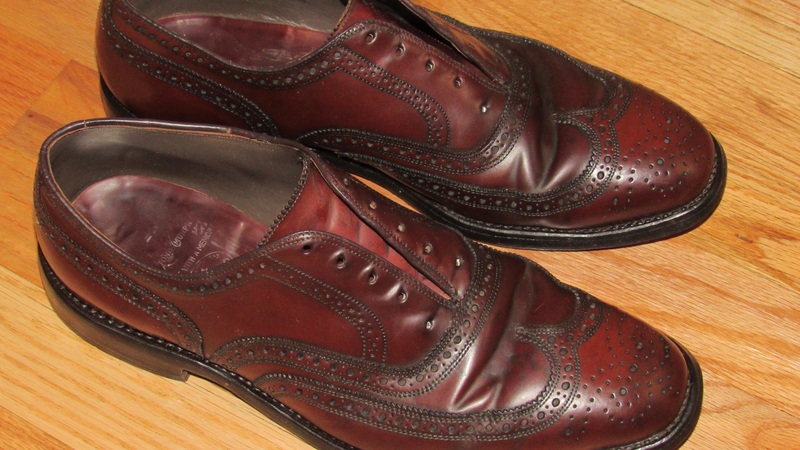 In the photo below, I put my other Johnston & Murphy Shell pair next to the restored pair. My other pair has a higher shine and the color is a more typical Color #8 eggplant hue. Here are a couple more photos of the finished product. Sorry, couldn’t help it. 😛 Great post and awesome blog! Thank you. You are now my offical editor. The job doesn’t pay much. Sorry. Good one, thanks for the tip! RenoMat definitely lightened them. There was a lot of old polish on my rag. It didn’t appear to change the color though. Its a great product. A great toxic product. Great work, thanks for sharing your process!! Will have to keep my eyes peeled for pairs like this on eBay! 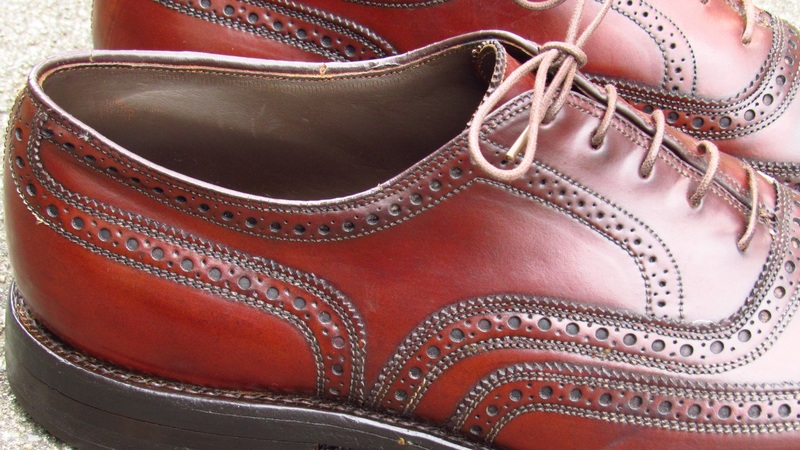 I tried your method over the weekend with a pair of Florsheim 93605 shell wingtips and it worked like a charm. The curl straightened out and the rolls on the vamp were greatly reduced. My soak time was about 1.5 hours before the shell was totally saturated, so apparently there is some variance between manufacturers (or perhaps your pair just had more product applied to them!). Cool. I am glad it worked. You never know. Let me know how they wear. I wish you could post a photo. That is something Mr. Vcleat needs to figure out. Great blog/site; very informative. Can you please describe your “lacing” technique? that looks fabulous. Thanks; Regards. Any follow up on this? 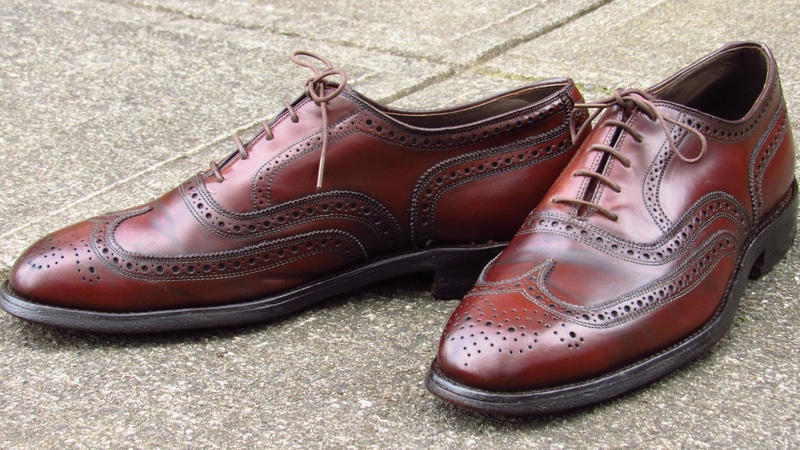 I tried the same on a pair of Florshiem 93605’s and was delighted with the results….. until I put the shoes on and wore them. As I pulled the laces tight , all the eyelets on the right shoe split, to say the least I was bummed. I wore the shoes on a couple of occasions knowing that they were doomed, but wanting to continue the experiment. The right shoe also tore on the toe box. The left shoe showed no damage, but the waves did show signs of reappearing. Thats awful. Sorry to hear that. I have had some vintage shell shoes tear, but nothing like that. I will note your story above in the article. For my own education, did you do anything different regarding drying them or conditioning the pair? To be perfectly honest, I’d probably try it again with a similar pair of shoes. I was very happy how they came out until they tore. Here’s a bit of advice though, wait as long as possible for the shoes to completely dry. I set mine outside on a warm day and waited about a day and a half. If I do it again I’ll wait 4-7 days. I’m fairly certain that I’ve read that leather, when wet, loses a great deal of its strength. Be patient, there’s a good possibility that if I had been, the damage could have been avoided. I conditioned them almost manically before and after, that wasn’t the issue. On the shoe that did tear, the Shell seems somewhat thinner and more worn than the other that didn’t. It’s possible that the shoe might have torn if I let it dry for a week anyway. Thanks for the details. I once had an unworn NOS 93605 tear just by wiping them with a damp cloth. I believe the pair might have be stored in a hot attic for 40 years and were too dried out. This J&M pair is too small for me to wear but I just spent some time flexing and stretching them and the leather was supple. No issues. Still, its not like wearing them for 6 months. Just got another pair of 93605’s , perhaps slightly better shape. I may decide to experiment with them too. If I do, I’ll take pictures if you’re interested. Have you had any experience with Allen Edmond shell? 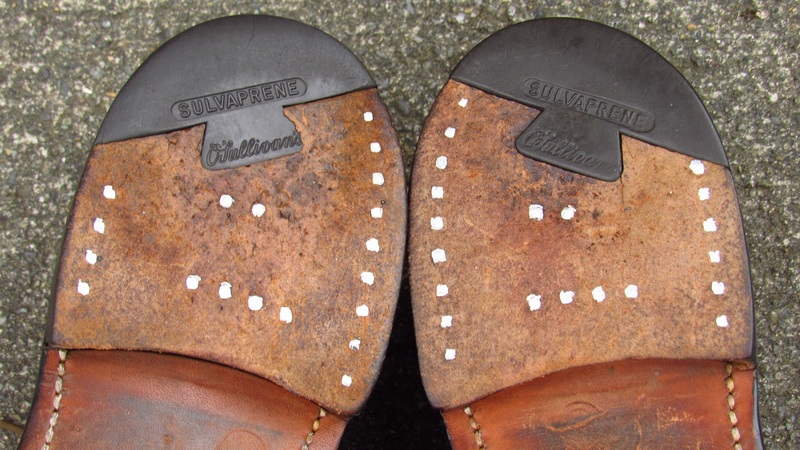 Bought a pair of Randolph loafers but has significant deformity on the heel area and want to apply this trick.